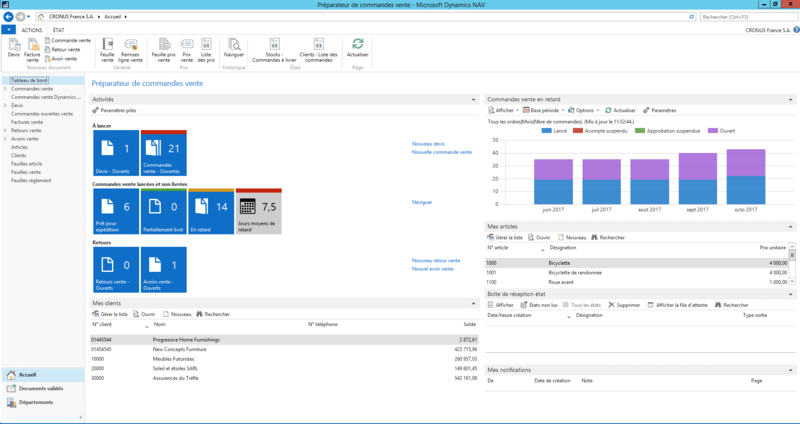 Microsoft Dynamics NAV features business intelligence tools, providing you with a new view of your company. You can use the dashboard features to generate statistics on your turnover, customers, and purchases, etc. Leading a company involves analysing different kinds of data, but above all means making the right decisions at the right times. The high-performance business intelligence tools facilitate and support decision-making, allowing you to quickly understand the position of your business. Microsoft Dynamics NAV includes a powerful reporting tool with dashboards and indicators to give those in charge a daily, fortnightly or monthly view of business activity. The query builder and dashboard for accessing various data on the company’s activity are native to NAV. Data (updated in real time) is easy to access and can be integrated into Excel with all of the related features: pivot tables, formatting, graphs, etc.